My series about the exhibit Two Centuries of Black Art (1976–1977) continues. 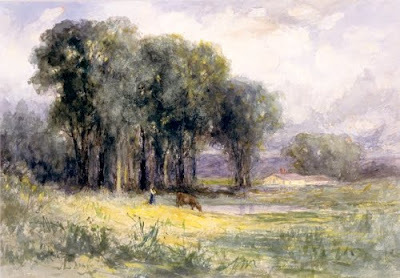 Edward Bannister’s paintings always put me in the same mood as the paintings of the Barbizon “school” artists who were the precursors of French Impressionism. Actually, Bannister was introduced to that style by the painter William Morris Hunt (1824–1879), who was a buddy of the French painter Jean-François Millet (1814–1875). Millet painted with the Barbizon painters at times. Bannister’s work displays not only the Barbizon love of painting nature, but also the spiritual power of it. I find his works a wonderful combination of awe and melancholy. Born in New Brunswick, Canada, Bannister received a good education, as slavery was abolished there in the 1830s. An ardent draughts-person from a young age, he went to sea in the merchant marine in the late 1830s and settled in Boston in the 1840s. He learned the Daguerreotype photographic process and became an expert at tinting photographs. He learned a great deal about European art visiting museums, galleries, and libraries. He also worked in a hair salon to earn a living, while painting was his first love. In the 1850s he began to exhibit his paintings, the majority of which were landscape. This lovely study has “Barbizon” written all over it. Some of his studies—such as the pastels that are in the Brooklyn Museum—are more stunning than his finished works, because of the spontaneity and acuity of his vision. Check back Monday for part 5 of the series with the work of Clementine Hunter.